My February 2018 weekend trip had me going to Mystic Connecticut for a visit to the Mystic Aquarium. 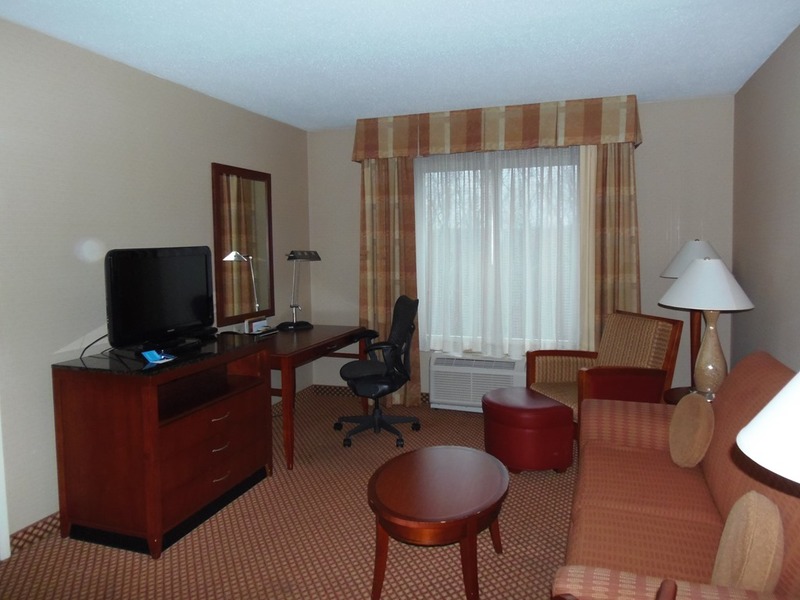 I stayed at the Hilton Garden Inn Mystic/Groton, which was about a 15 minute drive from the aquarium. The drive to the inn from my last job was a little over 2 hours. Not a bad drive, traffic was quiet for a Friday afternoon and I had no major slowdowns all the way to the inn. The weather was nice for an afternoon drive which added to the comfort of the whole experience. It was about 5:30 when I arrived. There was no one waiting at the front desk and as I had already done an online check-in the evening before, there was no waiting for me, I just got my keycard and the obligatory amenities speech, and I was off to my room. After a quick shower I had to decide what I wanted for dinner. I choose to order from a local 99 restaurant and get me some take out, rather than going and waiting for seating. I really just wanted to relax for the evening. Television offered nothing that I was interested in, I am not much of a television watcher anyway, so I set up my tablet and listened to Pandora for the evening. After a good nights sleep and breakfast at the inns restaurant I was off for my days adventures. Mystic Aquarium here I come. I had purchased my entrance ticket online a couple of months before the trip, yea I plan in advance, so I bypassed the line of people waiting to get tickets and walked right in. At the time that I went there where a handful of exhibits that where closed for renovations, because I had purchased so far in advance and paid full price, they had a 15 percent discount going on, I got a free pass to come back anytime till the end of May this year. I have a weekend planned in April that is not that far from the aquarium and I may take a visit on that weekend. I took in the 4D movie, which was a bit shorter than I expected but still fun. 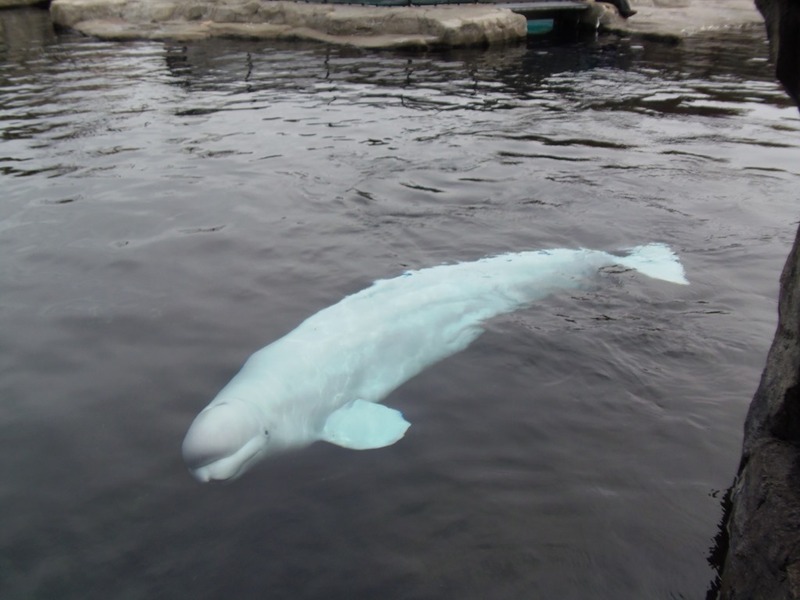 Whilst I was standing at the large pool side where the beluga whales swim I had the unexpected fun of listening to a woman telling her friend how she has the ability to whistle to the whales. She stood there whistling for about 5 minutes. The whales swam by at a distance but did not swim up to where we were standing which had the woman explain to her friend how her whistle must be out of tune. It gave me a bit of a chuckle that I did keep to myself. After a couple of hours spent walking around and checking out the exhibits I headed to my car. Just as I walked out of the aquarium proper it started to rain. I thought how lucky for me. I found it was still early and I had time to do something else. Checking out the local attractions I found that I was just a short drive from the Foxwoods Casino. It has been a while since I had gone there and I always find it a fun place to go and people watch so that was my next destination. I spent a couple of hours walking around Foxwoods Casino Resort doing some people watching and a bit of playing the slots. I didn’t do badly at the slots, I actually think I may have broken even. After a ride back to my hotel room, I ended up spending a relaxing evening in my room watching some standup comedy and enjoying dinner. After a good nights sleep and a good breakfast I checked out and headed home. The drive home was in the rain but the traffic was quiet and made the drive fun. Join CeeLee over at the Adult Pool and myself for our blog ping pong story featuring characters from both of our blogs with the help of Todays Author’s Writing Prompts. It had been far too long since Aaron had worked and he knew he needed to get back to it. He got lucky, a couple of quick repair jobs and a small remodel job came to him almost immediately. After Aaron went into seclusion from everything the few workers he had left went off to find work either for themselves or other towns for work. Most of the help had left saying that they were getting creepy feelings from working on the Camden Estates project. Oh what a mess that is turning out to be. Driving to town and past the project he looked over at all the heavy equipment sitting there wondering what he was going to do with all that land. Thinking that he could not bring himself to go back down there and face those things. He really did think he was going crazy. “Why would a hallucination of a woman come up to me and ask for help.”. That what had happened to him on the last day he was on the project. That was almost 5 months ago. He went home that day and did not go back out for any reason. Till today that is. Back to work and hoping things work out for him. Getting the repair job done and checking out the remodel Aaron felt that it had been a productive day and no spirits to bother him, to the bank to make the deposit and back home where he feels safe. Waiting in line Aaron got a chill on his neck that made him jump. He was sorta getting used to this sensation, he knew when he turned around he would see an apparition of some sort, although he was not sure what kind. Most are regular looking people that he could kinda see through. Aaron looked around nervous and was shocked to see that no one was doing anything more than what they were supposed to be, the tellers passing out money, people at the clerks counter watching their teller and people waiting in line looking at their watches or just looking around. The robber walked right by Aaron up to an empty teller station, waited a minute and then walked right out the door with a bag in his hand. He looked around the bank and still no one was acting any different, like nothing had happened. Aaron started to shake a bit and just turned around and walked out of the bank thinking that he really was going crazy. He made a bee line straight for home because that seemed to be the only place that he felt safe and did not see any of these crazy hallucinations. He returned home from work to find an eviction notice tacked to the door. “Well damn” Aaron thought. “now I need to go back to the bank and see about getting an extension” and that thought gave him a bit of a shiver as well. That’s when he saw that his door was open a crack. He slowly pushed the door open and tip toed into the house trying to be as quiet as possible. Hello all and welcome to my blog. So I started this blog so that I could get some practice on my writing skills. I have no direction as to where the blog will go and do not really intend to get one hence the title Random Thoughts. I will be posting general thoughts I may have. I will be posting from any kinds of prompts that i get and if any comments are posted that make think of something to write I will be posting those thoughts as well as a thank you to the commenter in the post.